This process not only reduces the paper aging, but will improve the dielectric strength of the insulation and increase reliability. It enables transformers to be run on higher load cycles with greatly reduced risk of failure. The increased plant utilization will allow capital expenditure to be deferred. If the transformer life is dependent on the condition of the paper and the amount of moisture that is present in the cellulose and oil system, proactive measures instead of reactive, allow moisture to be controlled more effectively. On-line systems, such as DryKeep®, that gently remove moisture are preferred to the interactive systems that are used at prescribed intervals. DryKeep® is the proactive permanent solution for power transformer life extension. DryKeep® USA’s SMART design includes permanently installed moisture-in-oil sensors and a PLC-based monitoring and control system. 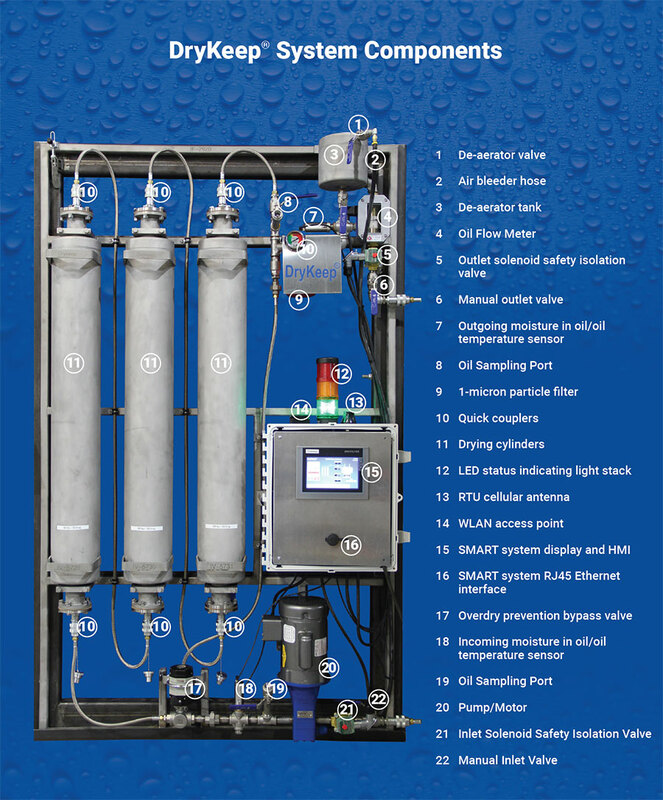 This continuous monitoring and dehydration system measures the water content and temperature of the oil, reducing paper aging and increasing dielectric strength. *(SCADA Monitoring Analysis and Reporting Technology) Read more here. DryKeep® is a very cost effective solution to moisture removal and was designed by a major electric utility that recognized the value of continuously removing moisture from the cellulose insulation. It is a continuous on-line, non-invasive system that gradually removes the moisture not just from the oil, but also from the paper insulation. Other methods in use today rely on rapid drying of the oil and possibly a partial removal of moisture from the cellulose. Soon after removal of their system to another transformer, the moisture always builds up again. Utilities throughout the world are facing the ever-increasing problem of managing aging substation transformers that are fast approaching the end of their service life, all at a time of increasing demands to use assets to their fullest while maintaining system reliability with fewer personnel and reduced financial resources. The cellulose insulation is the one component of a power transformer that will degrade with age and cannot be replaced without considerable cost and loss of service. The main factors that contribute to the degradation of the cellulose insulation are moisture, temperature, and oxygen. Moisture in a transformer’s insulation system causes the molecular chains of the cellulose to decompose, which speeds up the aging process of the cellulose and adversely affects the tensile strength and dielectric properties of the insulation, leading to premature failure. Until fairly recently, it was assumed that the only source of moisture was ingress from the ambient air surrounding the transformer due to leaking bushings, gaskets and seals. However, moisture builds up internally even in a completely sealed transformer as moisture is a by-product of the degradation of the cellulose insulation. Installing DryKeep® on all of your power transformers will permanently remove the moisture from the oil and cellulose insulation which in turn will: 1) Slow the aging of the transformer. 2) Increase the dielectric strength of the insulation system. 3) Increase service reliability and safety 4) Lower costs and capital requirements. 5) Extend the life of and maximize the value of this expensive asset. A DryKeep® installed on a new or recently reconditioned transformer will maintain the moisture content at the 0.5% factory level as it removes small quantities of water. It may more than double the design life of this expensive asset for a fraction of the cost of a new transformer. DryKeep® will extend the service life of the transformer by many years by slowly reducing the water content of the paper and maintaining it at a predetermined level. DryKeep® will predetermine the amount of moisture in the paper before installation and estimate the number of cylinder changes required. The amount of time required to dry out the unit will vary with the size, moisture content and operational temperature variation. Off-line transformers should be kept free from moisture formed through condensation during normal ambient temperature cycles. When the transformer is returned to service, the oil must be dry and capable of handling the electrical stresses of loading. DryKeep® is an obvious solution.